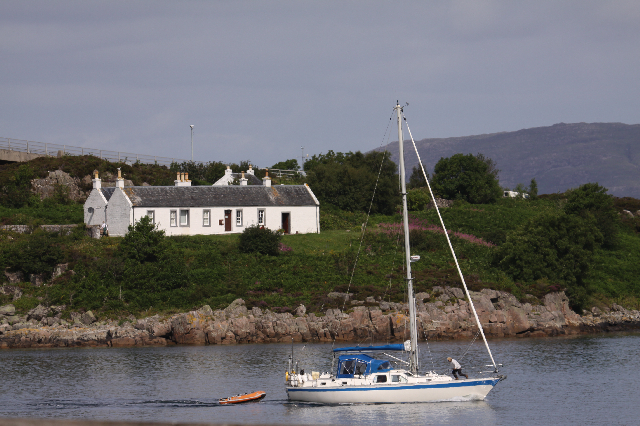 For those who respect and enjoy the peace and quiet of a nature haven, the keepers cottages on Eilean Bàn are available to rent. This exclusive self-catering accommodation offers the chance for guests to spend time doing their own wildlife spotting on the island, although the warden is on hand to point out the various flora and fauna to look for. Guests can wander the clearly marked paths at their leisure, and the island makes a perfect base for exploring all that Skye and Lochalsh has to offer. Read Virginia McKenna's description of Eilean Bàn - selected as her ideal British winter location in BBC Wildlife magazine. There are 2 bedrooms, sleeping 4 people, as well as a kitchen/diner, sitting-room (including TV and heating stove) and bathroom with shower over the bath. There are electric storage heaters which keep the house warm and cosy. The kitchen is equipped with a cooker, fridge, freezer and washing machine. Linen is included. Please book your stay via the Scottish Cottages Eilean Bàn page.